I would also appreciate a chance to chat with some microbiology undergrads and grad students about microbiology (concepts, learning), from the undergrad/grad student point of view. Again, I need to sort through some things, but if you are (or know) an undergraduate or graduate student in microbiology who might be interested in this type of discussion, I’d love to hear from you! We had our first #microhangout today! I really enjoyed getting to chat with other microbiologists (all of whom were hundreds or thousands of kilometers away from me, geographically). A huge thanks to the folks who participated! I’ll likely post on some of the stuff we discussed (and topics for possible future discussions) soon. More generally, I just found myself reflecting on all the technologies we used in setting up and having our chat … Some early musings posted on Twitter to see who might be interested in a virtual meeting, a Doodle poll to find a suitable day/time, and Google+ Hangouts for the actual conversation (with some documents shared on Google Drive relating to our topic). It wasn’t all seamless – I’ve now learned that I must check and double-check time zones in Doodle, and there were some hurdles using Google+ Hangouts. Still, within a few minutes of our start time, we had folks interested in microbiology education from Canada, the U.S.A., and the U.K. all having a conversation in real time. When the technology works, and allows us to make these kinds of connections, communicate, and collaborate, it’s awesome. To prepare, I’ve been trying to verify the email addresses of the folks who participated in the Doodle poll – I’ll need the email addresses to send invites. For anyone who’s interested, I’d be happy to do a “mini-hangout” later today or tomorrow morning, so we can test the system. If you haven’t used Hangouts before, please visit: https://tools.google.com/dlpage/hangoutplugin to download the necessary plugin. If anyone has suggestions or tips, please feel free to share them (here, or via Twitter or email) …! Thanks to all the folks who participated in the Doodle poll (now closed) for our first #microbiologyhangout! Wednesday, July 31 from noon-1 PM (EDT)* was the only time slot chosen by all who weighed in. I’ll post info about Google+ Hangouts once I’ve had a chance to learn (and play!) more …! Doodle poll now up for first microbiology hangout! 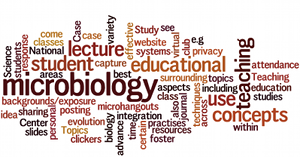 Google Hangouts for Microbiology educators – soon! I really appreciate the opportunity to talk to other science/biology educators (as I recently was reminded, at WCSE2013 and the annual oCUBE UnConference). At the moment, I’m working on revamping my microbiology courses for next year, developing online versions of them, along with online resources. I’d like to do more with threshold concepts and addressing common microbiology misconceptions in my teaching, and I am sure that I’m not alone. Twitter has allowed some interesting/useful conversations on microbiology education, but I’m thinking I’d like to chat with microbio educators beyond 140 character chunks. I don’t know how much interest there will be, but I plan to set up some Google Hangouts (or some other collaborative communication system) where we can discuss some of the educational issues/tips/questions that we might share. I would also like to find ways of sharing some of what we come up with – being as open as possible. I’ve mentioned this Twitter, and will likely email some folks who come to mind. If you’re interested in this, please drop me a line!